Two female suicide bombers have attacked Baghdad's main Shia shrine, killing at least 60 people and injuring 125 others, officials in Iraq say. 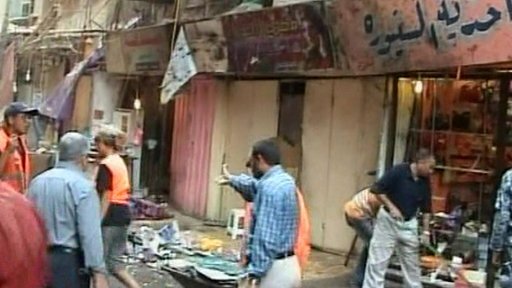 It comes a day after 84 people were killed in two separate suicide attacks in Baghdad and Baquba. 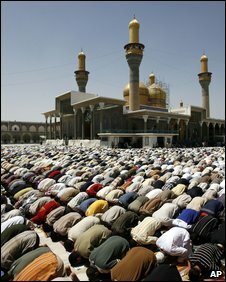 Many victims in Baquba and in Baghdad on Friday were Iranian pilgrims and the violence was condemned in Tehran. Violence fell sharply in the last year and the latest bombing does not change this trend, but it is a worrying development, says the BBC's Jim Muir in Baghdad. Early reports suggested the attackers had detonated explosives belts near two gates of the revered shrine, which was crowded with worshippers. However, a senior Iraqi bomb disposal officer later told Reuters news agency that the suicide attackers had used two leather bags packed with explosives, which they set down among the crowds at two of the gates to the shrine. "They used sidestreets to get there and this enabled them to avoid checkpoints," said Major-General Jihad al-Jabiri. The howling of the wounded echoed through a nearby hospital where the victims were admitted, the hallways packed with security forces and anxious family members looking for loved ones, an AFP correspondent reports. The shrine is the Shias' most revered location in the city. Carrying out the attack on a Friday, when the shrine would be crowded with worshippers, was clearly aimed at maximising both the number of casualties and the degree of sectarian provocation involved. It was attacks like this that helped fuel the cycle of sectarian violence that took many thousands of lives in 2006 and 2007. The past year or more has seen a huge improvement in the security situation. But deadly suicide attacks seem now to be intensifying once again, raising fears of a return to the bad old days. Many Iraqis will however be worried that it could be a sign of worse to come when the American troops complete their withdrawal, as they're supposed to do by 2011. Sabiha Kadhim, 50, had come up from the southern Iraqi town of Diwaniya with her family, four of whom were killed in the blast. Lying on a stretcher, her head and hand bandaged, she said: "I was near the shrine and suddenly there was a huge explosion and a fire broke out. "I saw human body parts everywhere." Qassim Zada, a 62-year-old Iranian pilgrim from Tehran, had come to the shrine with his wife. He now lay in hospital, his clothes soaked in blood. "I was only a few metres [yards] away from the explosion and I don't know what happened," he said. The shrine, in a predominantly Shia neighbourhood of the capital, has been a target for insurgents in the past. Around 25 of those killed on Friday were Iranian pilgrims, Iraqi police said. Most of the 56 people now known to have been killed when a suicide bomber blew up a restaurant in Baquba, Diyala Province, on Thursday were also Iranian pilgrims. On the same day, a suicide bomber infiltrated a crowd of displaced families in Baghdad as they received supplies from police, detonating an explosives belt and killing 28 people. At Friday prayers in Tehran, Ali Akbar Rafsanjani - the influential Iranian cleric and former president - condemned Thursday's attack on pilgrims. "The incident yesterday was a very, very hateful example of those who harm religion in the name of religion," he said in a sermon broadcast live by Iranian radio. "We feel sorry for the Iraqi people because such corrupt groups have penetrated into Iraq. We also criticise America for not having the serious will to preserve Iraq's security." Meanwhile, new statistics from Iraq's health ministry say that since 2005 when violence worsened more than 87,000 Iraqis have been killed. The figures are based on hospital and mortuary records and are seen as significant given the heated and highly politicised debate over the human cost of the war in Iraq, our correspondent says.